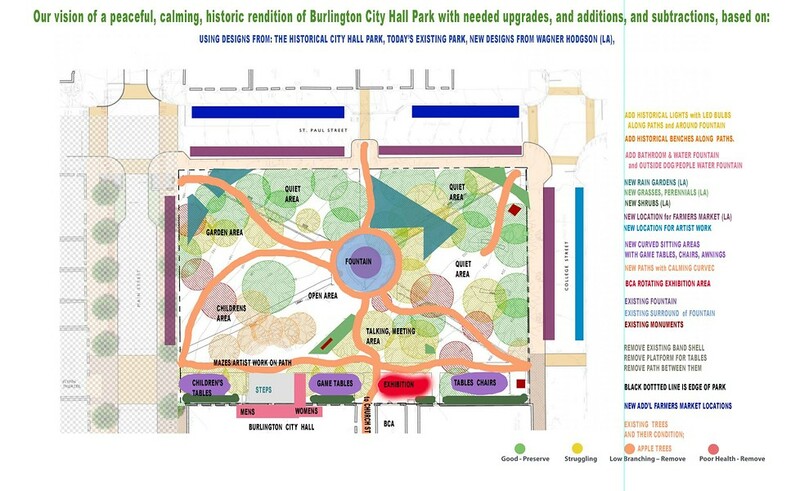 A new proposed design for Burlington’s City Hall Park is making the rounds of committee and board meetings. City officials want input for upcoming renovations. 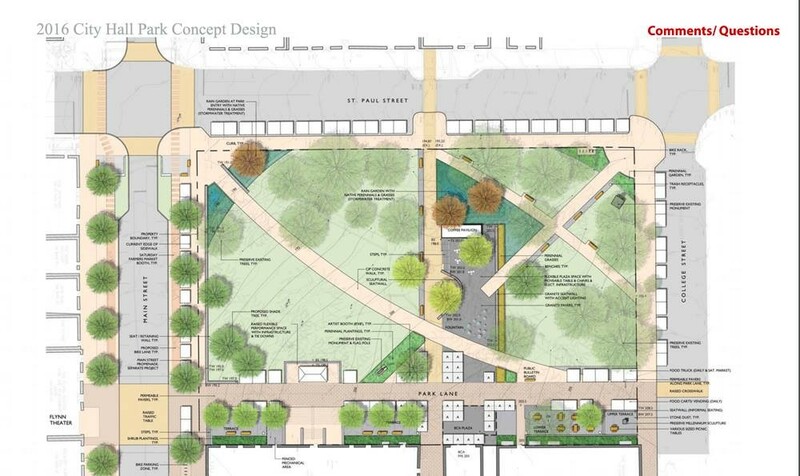 A citizens’ group is meanwhile promoting a competing vision for the downtown green space. 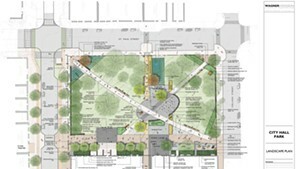 The city’s conceptual plan, designed by the Burlington-based Wagner Hodgson Landscape Architecture, has been five years in the making. The design includes an informal performance area and an interactive fountain for children to play in. The plan includes widened pathways and open green space. 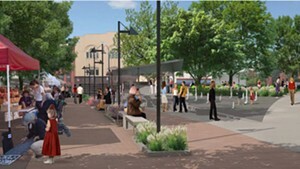 The central fountain would be removed and additional trees would be planted. The city is scheduled to break ground in 2018. The park, alongside Burlington City Hall, must accommodate heavy traffic during weekly farmers markets in the warmer months, political speeches and protests, and musical events and social gatherings. Meanwhile, a group has gathered to promote its own design. On Wednesday, members of Keep City Hall Park Historic also presented their plan to the city council’s Transportation, Energy and Utilities Committee. The layout features meandering paths, a bathroom, a full-time maintenance employee to keep up and supervise the park, and “lots of flowers,” said Carolyn Bates, a member of the group. “You want to have people say: ‘Wait, I wanna go there, I like the quiet, I like the beauty,’” she told attendees. The city’s design process was jumpstarted by a four-month public engagement process in 2011. Funded by a grant from the National Endowment for the Arts, Burlington City Arts conducted surveys, held meetings, and put on artistic and musical events to gauge interest. Studies found that tree health was poor, and compacted soils led to erosion and increased stormwater runoff. The city has received some heated comments and angry emails over the course of the public comment period, said Bridges. The city will gather feedback generated at eight meetings scheduled between December 6 and 21, Bridges said. Bridges and other city officials said they will consider ideas raised by the group’s counterproposal. “The current design may need to be amended to make it a better park with a design that respects its history,” said Burlington Mayor Miro Weinberger. People have raised interesting questions, he said.